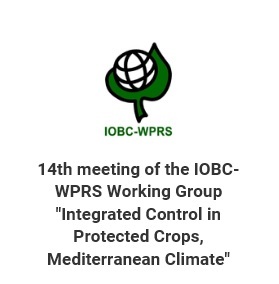 14th meeting of the IOBC-WPRS WG "Integrated Control in Protected Crops, Mediterranean Climate"
"The theme of the conference will be Pest control in Mediterranean greenhouses under the pressure of climate change and invasive species. On the behalf of IOBC and the organization, we would like to invite you to come to Lisbon and actively participate, and share the results of your work. The conference aims at bringing together all involved in the study of integrate protection on protected crops, for presenting and discussing the latest research and technological advances that may contribute to find effective and sustainable solutions to deal with these crops' protection challenges under a changing environment. It will provide an opportunity for exchanging information and ideas, as well as strengthening common research and collaboration and stimulating new interactions, among participants."